⚡ RangerBoard > Forums > Merchandise > DISCUSSION Auto-Morphin Turbo? Hey guys, from what I've read, the Auto-Morphin figures were released for MMPR, Zeo and Turbo, providing head molds for a lot of original Rangers. 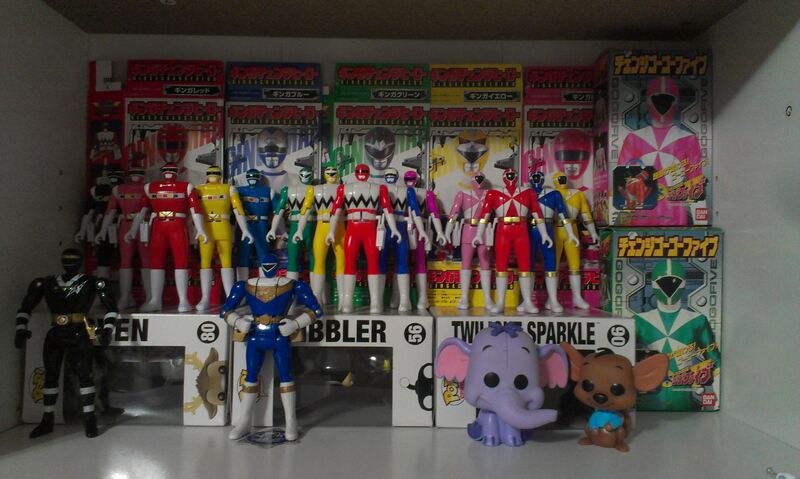 Did we ever get Auto-Morphin figures of the second Turbo team with TJ, Cassie, etc? Or of "In Space"? Or was the Auto-Morphin line discontinued at that point? No, just first team. There were megaranger flipheads, but not in space. The Auto-Morphin line was discontinued after Power Rangers Turbo. However, it was briefly revived during Power Rangers Lost Galaxy and Power Rangers Lightspeed Rescue, as the Automorphin and Infralight Power Rangers respectively. Lost Galaxy had introduced 10" tall sculpts that had very minimal poseability, restricted to the arms, elbows and wrists (I believe, could be wrong about the wrist movement), but they were made this way due to the special gimmick that they had. Each Ranger: Red (Leo), Blue (Kai) and Green (Damon) came with a Quasar Saber and Transdagger accessory, as well as a Transmorpher that you wore on your wrist and pointed at the figure. Pressing a button on the Morpher would send infrared signals to the toy causing it to "automorph" from Civilian to Power Ranger and then back again. Lightspeed Rescue duplicated the attempt, including the Rescue Blaster as an accessory and a Rescue Morpher with each of their three figures: Red (Carter), Blue (Chad), and Green (Joel). Correct me if I'm wrong, but I believe that Time Force had three Automorphin figures as well. Wild Force had seven of them: Red (Cole), Blue (Max), Black (Danny), Yellow (Taylor), White (Alyssa), Lunar Wolf (Merrick), and Zen-Aku. The six Rangers had their civilian heads with silver shoulder, wrist and leg armor, while Zen Aku had the Lunar Wolf Ranger Helmet as his alternate head. The way the gimmick worked with these figures is that you squeezed the legs and their torsos would spin around, flipping the head around in the process. There were also remote-controlled motorcycles with Red and Lunar Wolf Rangers whose heads would flip while the cycle was in motion. SPD also released two remote control cycles with the same features as the above mentioned Wild Force, with Red (Jack) and Omega (Sam) as the choices in color. After that, came the Mystic Morph figures from Mystic Force. Red (Nick), Green (Xander) and Solaris Knight (Daggeron) all had multiple faces including Ranger mode, Civilian and a chromed silver face that spun around at the push of a button on the face. Operation Overdrive had something similar as well, called Moto-Morph Power Rangers. Red (Mack), Blue (Dax), Black (Will), Mercury (Tyzonne), and Sentinel (Mack) all could transform into vehicles. The helmet would flip down to reveal a civilian face with a moving mouth to simulate the figure talking. And finally Power Rangers Samurai had Switch Morphin figures. Red (Jayden), Blue (Kevin), Green (Mike) and Gold (Antonio) all had a switch on the back that flipped the heads around similar to the MMPR Auto Morphins, but the alternate heads were masked faces. There were rumors of actual civilian faces in the liknesses of other Rangers, but these never came to fruition. My only real complaints are that with the Infralight figures, they were so sensitive that even a normal TV remote would cause them to morph back and forth, while with the Wild Force Spin Morphin figures, there just was no real articulation to speak of. Ironically, The auto morphin line got worse and worse. Mmpr versions had their flaws but they were the best, zeo were too bulky, turbo and wild force had no articulation. The rest of them were either just too big in scale or incomplete teams. The 2017 movie flip heads were atrocious. The Zeo ones were very bulky but sadly they were the only way to get GOOD articulated 5 inch Zeo figs at the time. What? You don't like your figures posed with one arm straight out from the torso at a 90º angle? Thanks for the comprehensive list! I'd love to get a whole set of Auto-Morphin' figures and some spare heads and customise a Turbo 2 team. Maybe get some Megaranger Auto-Morphin' figures and switch out the heads to have the Space team. Correct! However I believe they were exclusive to Bandai Europe territories. I owned all three, and purchased a second Red to custom into Quantum. Ah, thank you! I knew that I had seen mention of those somewhere before, and I recalled someone posting about them. I'm just glad I wasn't losing my mind briefly lol. Why do I seem to recall there was a Phantom Ranger figure somewhere with a Jason-esque head on it at one point? That could be said about a lot of Bandai's products.